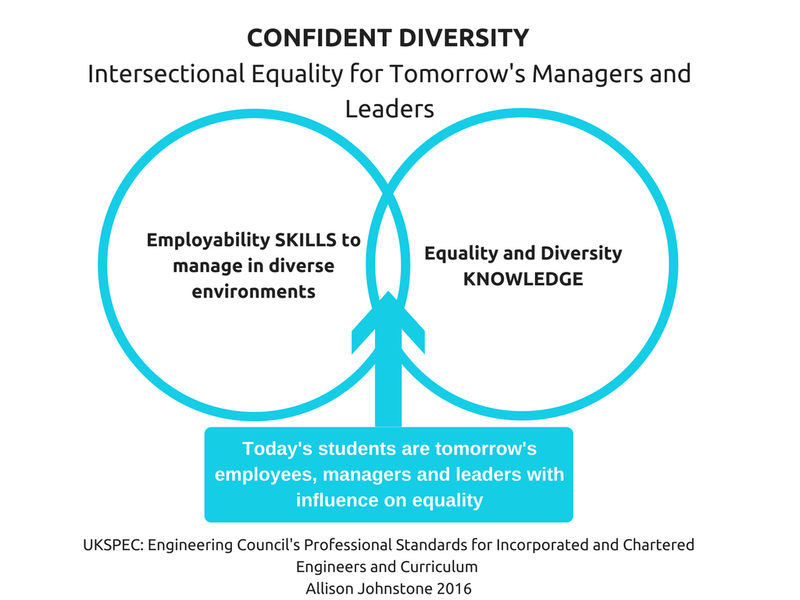 In the “Confident Diversity” model, input is embedded throughout the curriculum and linked to Professional Institutions’ standards. Students gain knowledge of issues around equality and diversity (e.g. the business case, intersectionality, unconscious bias etc.) whilst also developing skills which will support them to manage diversity (both in terms of equality strands and diversity of work approaches); communicate effectively with a range of people; and develop self-awareness and resilience. Following development of the model, Equate Scotland, the Confident Futures team and the School of Engineering and the Built Environment at Edinburgh Napier University partnered to run a pilot study with 3rd Year Engineering students. The pilot received excellent student feedback, with students’ average score for confidence in talking about difference and diversity rising from 6.4 prior to the workshop to 7.9 after. Over 60% of students identified new behaviours following the workshop and almost 90% of students identified new learning. Moving beyond engineering, by mapping the knowledge and skills development against other professional body standards i.e. CIPD, General Teaching Council etc. Moving beyond formal education to develop CPD offerings for current engineers working towards chartered or incorporated status, or indeed those that that already are chartered and want to think more about ED&I within their workplace. The project is currently at pilot project stage. Equate Scotland is working with the Higher Education Academy (HEA) to develop at 3 year project to develop this work further. We are looking to focus this work in engineering in the first instance and are looking for project partners from industry, education and professional bodies.